Cake covered and styled with White Chocolate Flavoured Fondant, all decorations made from same fondant. Does anyone know who developed this design, I need to thank them and give them credit for their fab work. 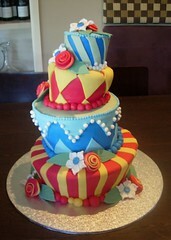 "This cake was designed by the owner of Polly's Cakes www.pollyscakes.com"